majority: nan-releegious an atheist, minority: Korean Buddhism, Korean Christianity, Muism (Korean Shamanism), Cheondoism, Islam. Backgrund o Korean Confucianism. 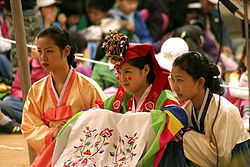 The Koreans are an ethnic group oreeginatin in the Korean peninsulae. Sooth Koreans caw thairsels Hanguk-in (한국인; 韓國人), or simply Han-in (한인; 韓人). Informally they caw themselves Hanguk-saram (한국 사람). North Koreans caw theairsels Chosŏn-in (조선인) or Chosŏn-saram (조선 사람). The ethnic Koreans, who live in Central Asie, caw thairsels Koryo-saram (Hangul: 고려 사람, Cyrillic: Корё сарам). ↑ "Population of South Korea 2010". English.chosun.com. 1 February 2010. Retrieved 4 May 2012. ↑ 4.00 4.01 4.02 4.03 4.04 4.05 4.06 4.07 4.08 4.09 4.10 4.11 4.12 4.13 4.14 4.15 4.16 4.17 4.18 4.19 4.20 4.21 4.22 4.23 4.24 4.25 4.26 4.27 재외동포현황/Current Status of Overseas Compatriots. South Korea: Ministry of Foreign Affairs and Trade. 2009. Retrieved 21 May 2009. ↑ Note that the 2006 American Community Survey gave a much smaller figure of 1,520,703. See S0201. Selected Population Profile in the United States. United States Census Bureau. Retrieved 22 September 2007. This page wis last eeditit on 11 Mairch 2013, at 12:02.